BSAUEEE 2018 (अब्दुर रहमान विश्वविद्यालय इंजीनियरिंग प्रवेश परीक्षा): The B.S. Abdur Rahman University conducts Engineering entrance examination for the admissions in various engineering and architecture courses. The students are required to submit the BSAUEEE Application Form 2018. The forms will start in the month of January. The aspirants can access them on the official website. The exam for the BS Abdur Rahman University Admission 2018 will be conducted in April. The students who will submit the form successfully only they will get eligible for the entrance exam. 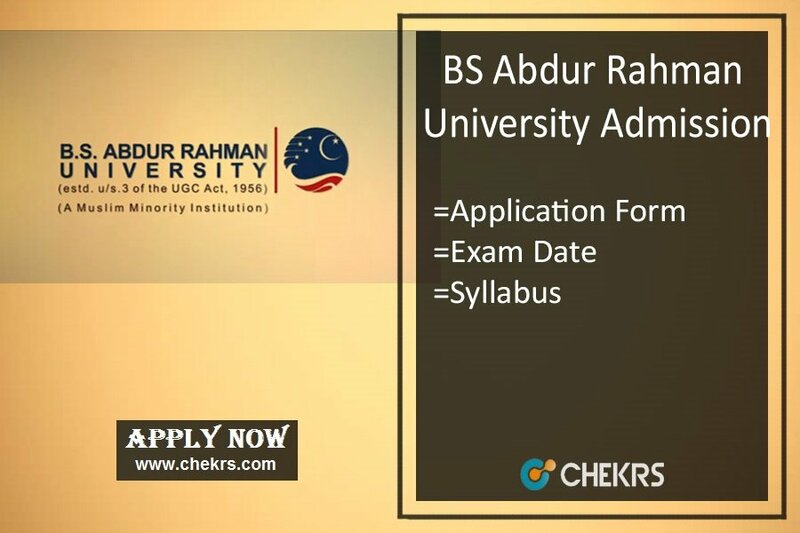 The students can register themselves by submitting the BS Abdur Rahman University Application 2018. The forms will be submitted only on the official website. the students have to submit the form before the second week of April. We will provide here the direct link for the submission of the BSAUEEE Application Form. The students just have to follow some precise procedure for the submission of the registrations. Steps to submit the form for BSAU Admissions. Then they have to click on the BSAUEEE 2018 link present on the left side of the homepage. Start filling the application form carefully and correctly. The aspirants have to enter their all personal details in the form. Then they have to attach scanned copy of documents, a passport size photograph and signature. Now they have to make payment for the form through any of the online payment modes. Submit the form after payment. The payment can be done through both online and offline modes. For offline mode, the students have to send a demand draft of Rs.750 in favor of ‘B.S. Abdur Rahman University’ payable at Chennai to the director of admissions. For Online Mode, The aspirants have to make payment through credit card, debit card, net banking or any online process of Rs.750. The aspirant must be born on or after 1st July 1995. They have to show their high school mark sheet as a proof of their age. The aspirant passed/ appearing class 12 from any recognized board can apply. They must have physics, chemistry and Mathematics as compulsory subjects. JEE Mains qualified students can also apply. They are exempted from any entrance test. Students must have passed 12th class from any recognized board. Must have physics, chemistry, biology or mathematics as compulsory subjects. They must have scored minimum 50% marks in the exams. The aspirants must have cleared class 12th exams with minimum 50% marks from any recognized board. Aspirants are required to have valid NATA scorecard at the time of admission. The aspirants preparing for the admissions in BS Abdur Rahman University are advised to check the syllabus. The BS Abdur Rahman University Syllabus will help the students to understand the topics in details. The questions in entrance exam will be asked from this below-provided syllabus only.